Tenascin-R‏ (Tenascin R) هوَ بروتين يُشَفر بواسطة جين Tenascin-R في الإنسان. ^ Leprini A، Gherzi R، Siri A، Querzé G، Viti F، Zardi L (December 1996). "The human tenascin-R gene". The Journal of Biological Chemistry. 271 (49): 31251–4. PMID 8940128. doi:10.1074/jbc.271.49.31251. ^ Carnemolla B، Leprini A، Borsi L، Querzé G، Urbini S، Zardi L (April 1996). "Human tenascin-R. Complete primary structure, pre-mRNA alternative splicing and gene localization on chromosome 1q23-q24". The Journal of Biological Chemistry. 271 (14): 8157–60. PMID 8626505. doi:10.1074/jbc.271.14.8157. Erickson HP (October 1993). "Tenascin-C, tenascin-R and tenascin-X: a family of talented proteins in search of functions". Current Opinion in Cell Biology. 5 (5): 869–76. PMID 7694605. doi:10.1016/0955-0674(93)90037-Q. Xiao ZC، Taylor J، Montag D، Rougon G، Schachner M (April 1996). "Distinct effects of recombinant tenascin-R domains in neuronal cell functions and identification of the domain interacting with the neuronal recognition molecule F3/11". The European Journal of Neuroscience. 8 (4): 766–82. PMID 9081628. doi:10.1111/j.1460-9568.1996.tb01262.x. Aspberg A، Miura R، Bourdoulous S، Shimonaka M، Heinegârd D، Schachner M، Ruoslahti E، Yamaguchi Y (September 1997). "The C-type lectin domains of lecticans, a family of aggregating chondroitin sulfate proteoglycans, bind tenascin-R by protein-protein interactions independent of carbohydrate moiety". Proceedings of the National Academy of Sciences of the United States of America. 94 (19): 10116–21. PMC 23322 . PMID 9294172. doi:10.1073/pnas.94.19.10116. Xiao ZC، Hillenbrand R، Schachner M، Thermes S، Rougon G، Gomez S (September 1997). "Signaling events following the interaction of the neuronal adhesion molecule F3 with the N-terminal domain of tenascin-R". Journal of Neuroscience Research. 49 (6): 698–709. PMID 9335257. doi:10.1002/(SICI)1097-4547(19970915)49:6<698::AID-JNR4>3.0.CO;2-2. Arrigo G، Gherzi R، Bonaglia MC، Leprini A، Zuffardi O، Zardi L (1997). "Assignment of the tenascin-R gene (Tnr) to mouse chromosome 4 band E2 by fluorescence in situ hybridization; refinement of the human TNR location to chromosome 1q24". Cytogenetics and Cell Genetics. 78 (2): 145–6. PMID 9371410. doi:10.1159/000134650. Volkmer H، Zacharias U، Nörenberg U، Rathjen FG (August 1998). "Dissection of complex molecular interactions of neurofascin with axonin-1, F11, and tenascin-R, which promote attachment and neurite formation of tectal cells". The Journal of Cell Biology. 142 (4): 1083–93. PMC 2132869 . PMID 9722619. doi:10.1083/jcb.142.4.1083. Zamze S، Harvey DJ، Pesheva P، Mattu TS، Schachner M، Dwek RA، Wing DR (August 1999). "Glycosylation of a CNS-specific extracellular matrix glycoprotein, tenascin-R, is dominated by O-linked sialylated glycans and "brain-type" neutral N-glycans". Glycobiology. 9 (8): 823–31. PMID 10406848. doi:10.1093/glycob/9.8.823. Olin AI، Mörgelin M، Sasaki T، Timpl R، Heinegård D، Aspberg A (January 2001). "The proteoglycans aggrecan and Versican form networks with fibulin-2 through their lectin domain binding". The Journal of Biological Chemistry. 276 (2): 1253–61. PMID 11038354. doi:10.1074/jbc.M006783200. Xu XR، Huang J، Xu ZG، Qian BZ، Zhu ZD، Yan Q، Cai T، Zhang X، Xiao HS، Qu J، Liu F، Huang QH، Cheng ZH، Li NG، Du JJ، Hu W، Shen KT، Lu G، Fu G، Zhong M، Xu SH، Gu WY، Huang W، Zhao XT، Hu GX، Gu JR، Chen Z، Han ZG (December 2001). 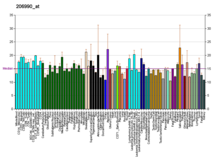 "Insight into hepatocellular carcinogenesis at transcriptome level by comparing gene expression profiles of hepatocellular carcinoma with those of corresponding noncancerous liver". Proceedings of the National Academy of Sciences of the United States of America. 98 (26): 15089–94. PMC 64988 . PMID 11752456. doi:10.1073/pnas.241522398. Woodworth A، Pesheva P، Fiete D، Baenziger JU (March 2004). "Neuronal-specific synthesis and glycosylation of tenascin-R". The Journal of Biological Chemistry. 279 (11): 10413–21. PMID 14681222. doi:10.1074/jbc.M312466200. Bukalo O، Schachner M، Dityatev A (May 2007). "Hippocampal metaplasticity induced by deficiency in the extracellular matrix glycoprotein tenascin-R". The Journal of Neuroscience. 27 (22): 6019–28. PMID 17537973. doi:10.1523/JNEUROSCI.1022-07.2007.